How could men of 4500 years ago build so grandly, so perfectly, when conventional archeology claims they had only recently been simple herders and farmers? 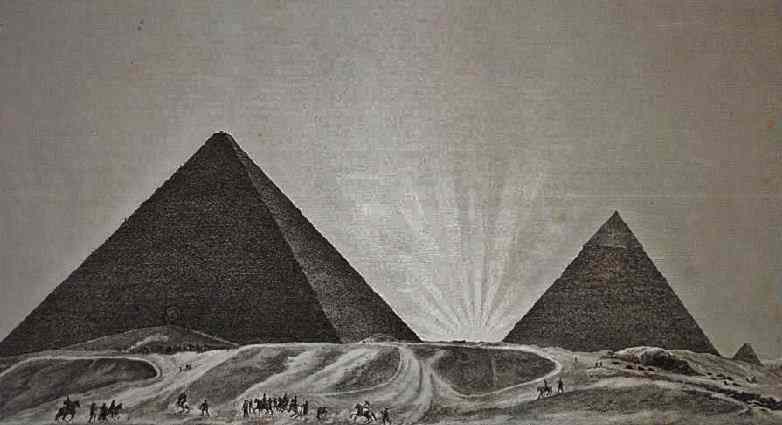 In all their attempts to explain away the pyramids, the archaeologists fall far short of plausibility. 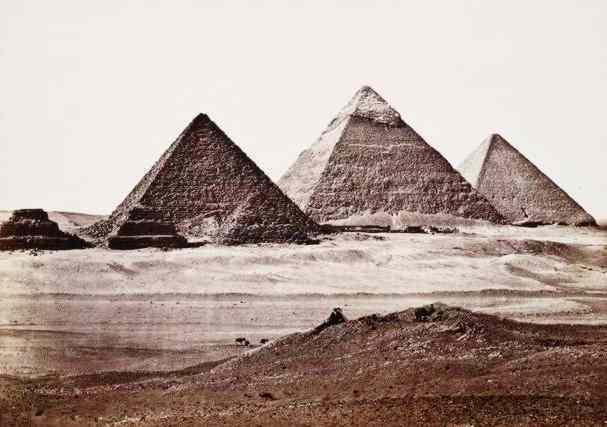 The Pyramids are simply too large, too well engineered to have been built at the beginnings of civilization. To visit the Giza Pyramids today one must survive a gauntlet of merchants, camel renters and guides, each with their agreed-on territory which you must cross as they stand directly in your way, all-but grabbing your arms. After paying the entrance fee you share the narrow spaces inside with an endless stream of chattering tourists. Whether you regard the Pyramid as a tomb, a temple, or something else, there is precious little silence in which to take in the enormity of the place. Engraving by David Roberts, 1838. 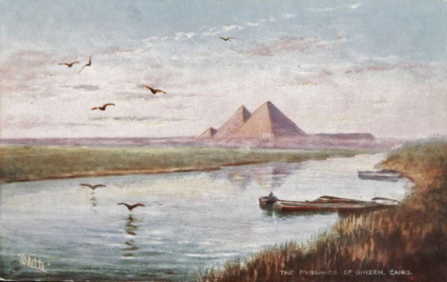 "'They are the tombs of Cheops and Chephren', says the Grecian. 'They are the tombs of Seth and Enoch', says the imaginative Arab. 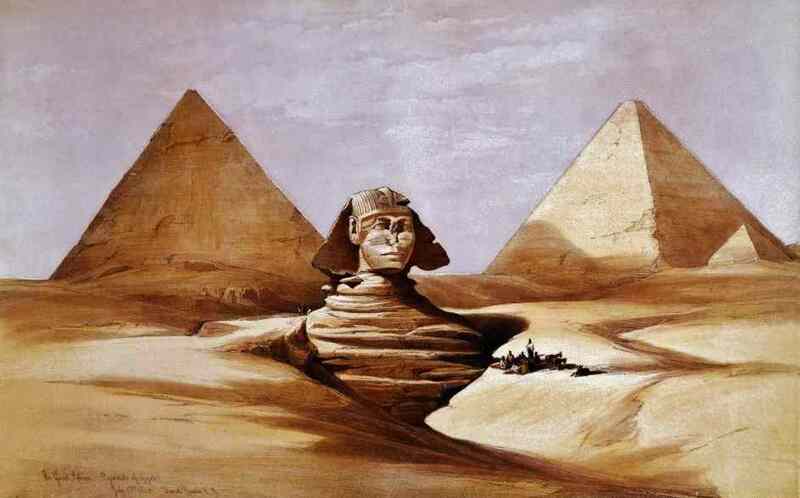 An English traveler with a mind warmed by the desert sun and misled by his heart, tells you that the Great Pyramid contains the ashes of the Patriarch Joseph. It is all this which constitutes the very charm of a visit to these ancient monuments. You smile, and your smile is followed and reproved by a sigh. One thing you know: that the king, and the philosopher, and the poet of the times of old, men who mark fields as they pass with their own mighty names, have certainly been here. Alexander spurred his horse to its base, and Pythagoras, with naked foot, stood upon its summit." (Left) Photograph by Espen Birkelund, CreativeCommons. 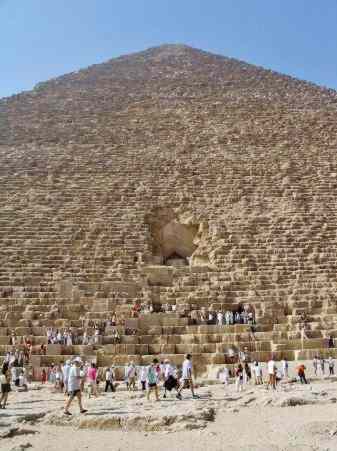 There are two ways to enter the Great Pyramid. Every day a long line of tourists waits to crawl into the twisted tunnel dug by those who would rob the treasures of this place. 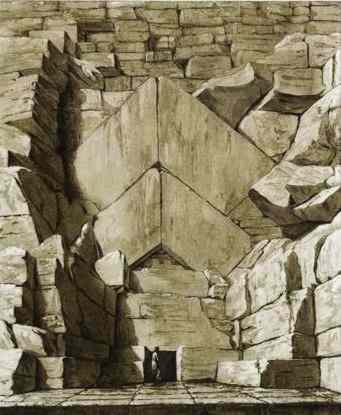 The original entrance to Cheops' Pyramid was hidden then. Exposed now by the loss of the Pyramid's limestone casing, the true entrance is far more impressive, a grand stone arch fit for a Pharaoh. We can safely ignore the tourists, only those with imagination can follow. PYMD.com has descriptions by both modern and 19th century authors and a number of beautiful 19th century engravings. We point out some anomalies and questions along the way, but the intent is to give the feel of the "World's most important archeological site". 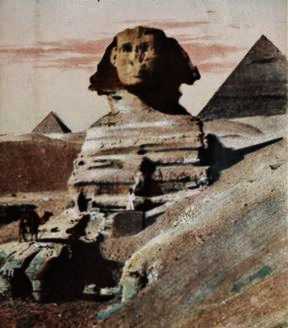 The final page (you can skip to it HERE) confronts the questions raised by the pyramids. These ancient wonders defy the conventional view of history and must eventually force a re-appraisal of the origin of human civilization.